I learned last week that my short story, “Reset,” about a father and daughter who set out to prove the Warren Commission wrong, had won first place in the Blue Ridge Writers Golden Nib Fiction Contest. “Reset” is one of those stories, which in the writing, becomes something close to you, and I was so proud it won this contest. The poem I wrote about here a few weeks ago, “Verses for Orlando,” won second place (second-freaking-place!) in the Blue Ridge Writers Golden Nib Poetry Contest. I. Had. A. Poem. Come. In. Second! It won’t go to the state-wide contest, but it will also appear in Skyline 2017. I. Will. Have. A. Poem. Published! I’m very excited. You may have noticed. How about you? Do you use things from your life and background in your writing? Are they some of your best stories or not? Eight months or so ago, a friend from UU bought my novella, My Noble Enemy. Her husband was about to have surgery, and she wanted something to read in the waiting room. I warned her it was about a man dying of cancer, but she said that was okay. A week later, I learned her husband had unexpectedly died of complications from the surgery, and I was worried that my novella was the worst possible thing she could have read. I figured she probably hated it and me for writing it. When she returned to UU the week after her husband’s funeral, she sought me out and told me reading My Noble Enemy had helped her through her husband’s last hours and that it had given her comfort because the character in it who died was surrounded by the people he loved and who loved him. I was stunned and humbled. Yesterday, all these months later, she told me the story still resonated with her as she continues to undergo her grief process, that she still needed the message of loyalty and compassion I wrote. I am still stunned and humbled by such praise, and it’s the best thing anyone has ever said about my work. I’ve always said I don’t write for money or acknowledgement but because I have stories I want to tell, that need to be told. That story was the right one at the right time for at least one person, and that’s all I need. How has something you’ve written resonated in an unexpected way? I’d love to know. Take a Chance on MY NOBLE ENEMY! Goodreads has approved a giveaway for my new novella (My Noble Enemy). My Noble Enemy This giveaway of seven, count ’em, seven, signed copies will be open for entries at midnight on Saturday, August 15. The contest will end at midnight on Thursday, August 20. Goodreads members (You have to be a member, but it’s free to join.) in United States, Canada, United Kingdom, and Australia can enter. After midnight on Saturday, August 15, click below to enter. Goodreads chooses the winners on a random basis. Giveaway ends August 20, 2015. See the giveaway details at Goodreads. 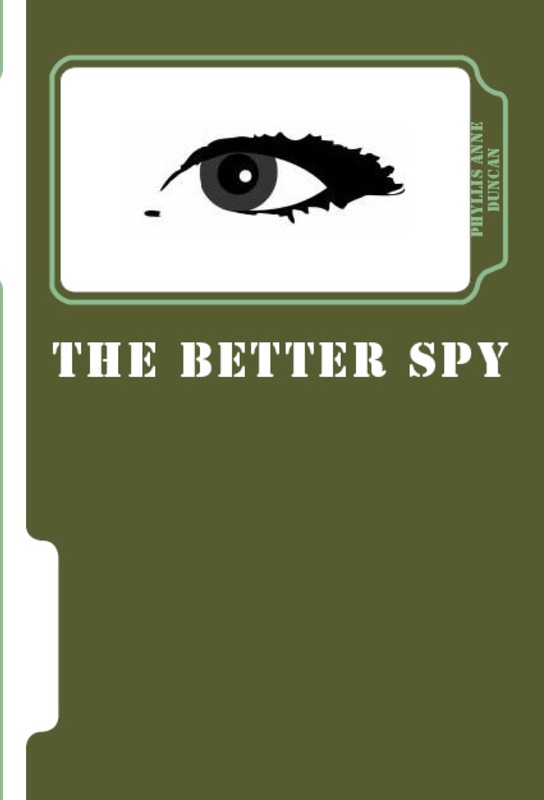 In a few days both the novella, My Noble Enemy, and the novel in stories, The Better Spy, will be up for Giveaways on Goodreads. If you have a Goodreads account (it’s free), you can go to the site and enter to get a free copy. I’ll be giving away six copies of My Noble Enemy and five copies of The Better Spy (all signed). These are separate contests, running for different time periods, so you’ll have to enter both! THE BETTER SPY – Release Date Announced! It’s official! My newest collection of short stories about the globe-trotting U.N. spies Alexei Bukharin and Mai Fisher, The Better Spy, will be released as a paperback and an eBook on July 28, 2015! 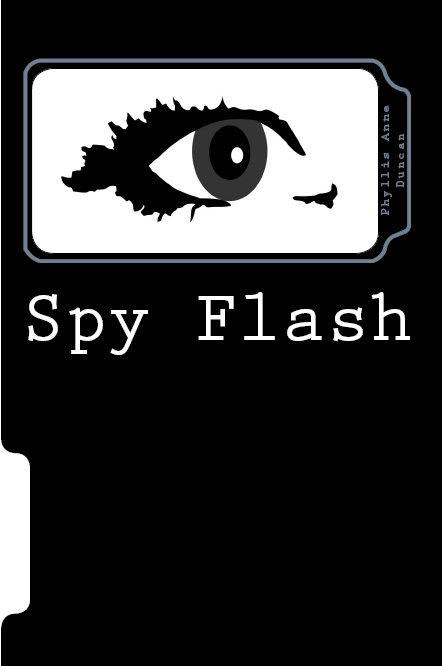 You first met Mai and Alexei in Blood Vengeance, Spy Flash, and My Noble Enemy (a Spy Flash novella). The Better Spy isn’t exactly a continuation but, rather, another piece in the mosaic of these two characters’ lives. You can pre-order The Better Spy starting today. Click HERE to pre-order. Enjoy! Flight Controller: 10, 9, 8, 7, 6, 5, 4, 3, 2, 1. We have lift-off! 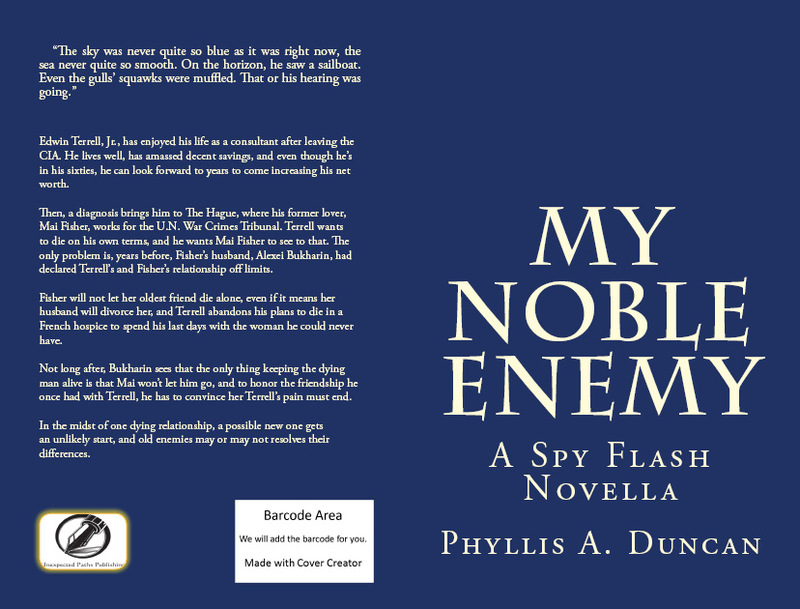 Lift off of Phyllis “Maggie” Duncan’s very first novella, MY NOBLE ENEMY! Ask yourself, what would you do if your best friend came to you and told you he was dying? You’d pretty much drop everything to care for him, even if it brings up old slights and opens old wounds. Most of all, you’d want the end to be peaceful. 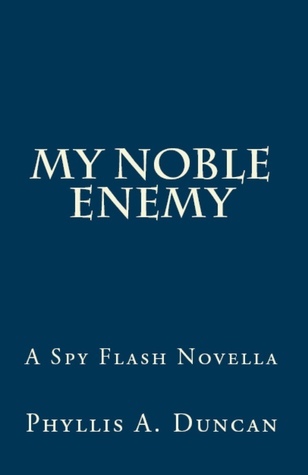 MY NOBLE ENEMY is not my typical historical thriller. Rather, it’s a love story on many levels–what friends will do for each other, supporting a spouse even if you don’t agree with his or her actions, and a bit of young love in, of all places, the red-light district of Amsterdam. Yeah, you know I had to be a little salacious. If you pre-ordered a Kindle version of MY NOBLE ENEMY, it will arrive TODAY! And if you’d like your Kindle version “signed,” go to authorgraph.com, look the book up, and submit a request for a virtual autograph. If you’re looking for a paperback copy, you can order one from Amazon.com–oh, if you buy a paperback, you can bundle the Kindle version at a bargain price. I hope you enjoy MY NOBLE ENEMY. MY NOBLE ENEMY – Ready for Pre-Order!! 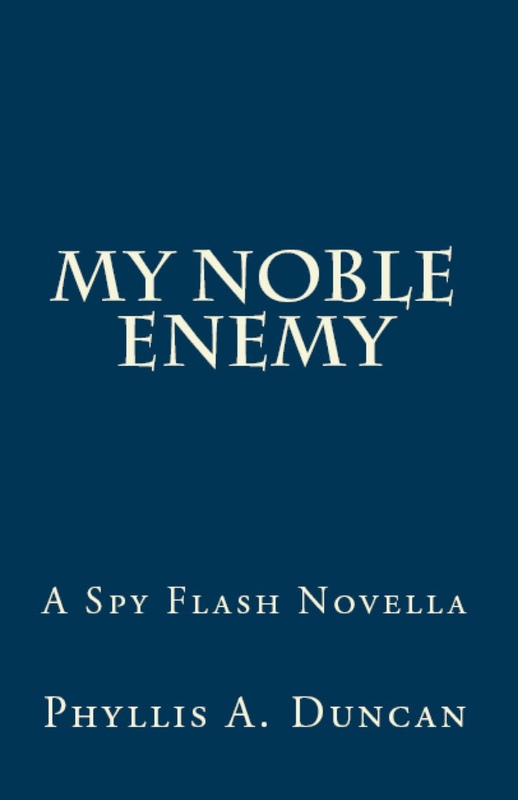 My Noble Enemy: A Spy Flash Novella is now available for pre-order for your Kindle or Kindle App. At just $3.99–what a deal! Plus, if you order the paperback (which is also a steal at $5.99), you can add the ebook for just $1.99! Feel like you’re in an infomercial yet? So much for the marketing skills. You can pre-order My Noble Enemy by clicking here, and on June 5, 2015, it will magically appear on your Kindle and be accessible on your Kindle App. But if you’re a gotta-hold-the-book-in-my-hands reader, you can order the paperback now. Did I mention it’s a steal at $5.99? Order the paperback by clicking here. Thanks for putting up with my attempt at positive marketing. It’s okay to laugh. More Good (and Bad) Writerly News! Two, count ’em, two stories of mine will be published soon: one in a fiction chapbook, the other in an anthology. “Reset” is a completely made-up story (as in not based on something which happened to me even though one character bears a strong resemblance to my father) about a father and daughter who attempt to prove the validity of the one-shooter conclusion of the Warren Commission Report. It will appear in the inaugural edition of The Ink Ribbon Reader later this year. For more information on Ink Ribbon Press, the publisher, click here. The other story is “Dreamtime,” winner of the Flash!Friday second annual flash fiction contest. It will be published in the anthology Skyline 2016, which will come out next spring, likely at a Virginia Festival of the Book event. My story, “Meeting the Enemy,” appeared in Skyline 2014. The Skyline anthologies are edited by author Olivia Stowe and published by Cyberworld Publishing. The bad news–and that’s the writing life–my story, “The Lost Diaries of Prince Leopold, Duke of Albany,” did not advance me to the third round of NYC Midnight’s 2015 Short Story Challenge. The judges liked the story, but one didn’t buy the voice in the story was a seven-year-old’s. I respectfully disagree, especially since I explained the child’s advanced vocabulary in the story itself, but, hey, can’t please ’em all. “Prince Leopold” will find a home, somewhere. “My Noble Enemy” will be available for your Kindle and as a slim paperback (117 pages), and I’m pretty excited about its upcoming release. Pre-ordering for this should be turned on some time in July, and it will also be available for Kindle or as a paperback. 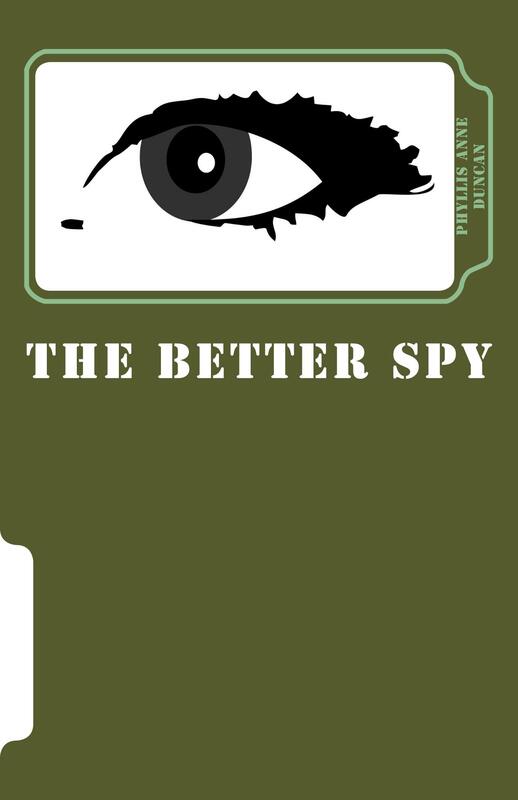 The Better Spy is in an experimental format, and not just as a novel in stories. It proceeds from “present day” (2013) to a seminal event in a character’s life in the mid-1980s. That puts a bit of a burden on the reader, but I’ve also put a date tag on every story to help with that. Lots of things to look forward to for the summer. Oh, and either or both of these new works would make great beach reads!